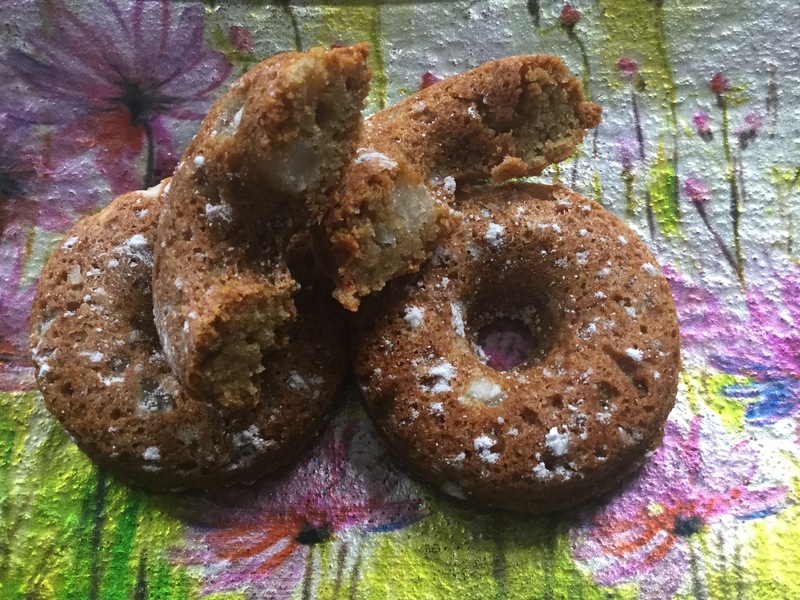 I’ve been fancying a ring doughnut, and have seen some made using apple sauce in other recipes so thought I’d have a try myself and build the rest of the recipe around how the batter was looking and feeling, I’m pleased with the results, and they are super quick and easy to make. They come out very well, with a lovely gentle apple flavour, I’ve made a quick chocolate glaze to top a couple with, but it’s really not necessary they’re good enough on their own, that being said though it’s a great standby recipe to have is the chocolate glaze as its so easy to make and gives great results every time. 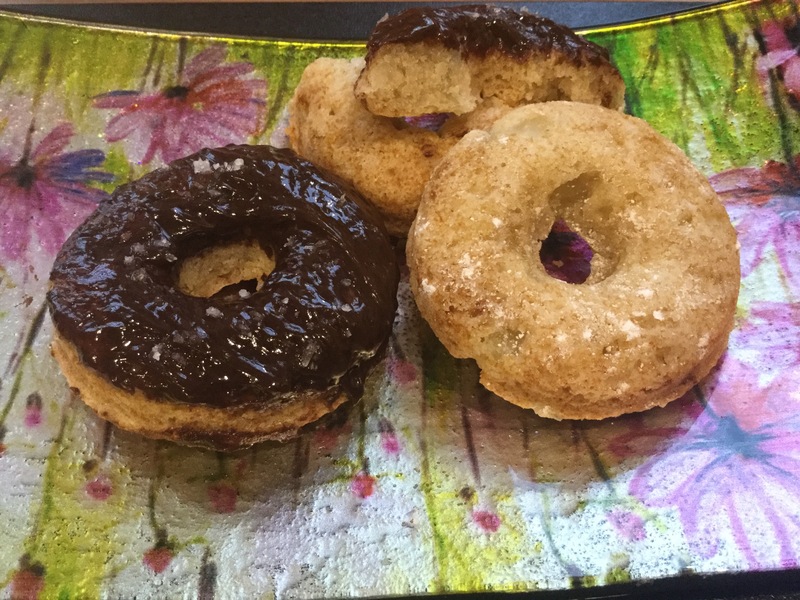 I’ve tried this recipe a couple of times now to ensure it gets consistent results, the main lesson I’ve learned from it is don’t bake the doughnuts for more than 10 minutes! As the sugars will start to caramelise too much and you’ll end up with a heavier texture, although it does make for a delicious treat still! what a difference an additional 2 minutes in the oven makes! In a large bowl mix together the flour, sugar, xanthan gum, bicarbonate of soda, baking powder and salt so that they are well combined. 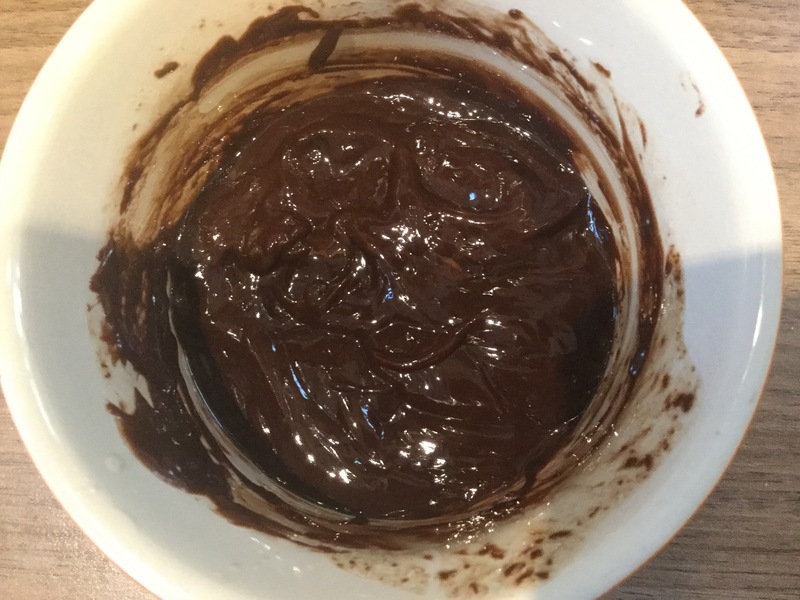 Add the oil and the apple sauce and start to mix, it’ll take a little bit of working to get the ingredients incorporated , but when you do you’ll have something resembling a thick paste. Fill a 6 hole doughnut tray with the mixture and place in the oven for 10 minutes, until the doughnuts are a pale golden brown. To make the glaze, break up the chocolate and add to a microwaveable dish with the coconut oil and soya milk. Pop in the microwave for 15 seconds take out and stir together, it may need a little longer but not much! The mixture should come together to make a beautifully glossy glaze that will set up in the fridge. I find the best way out to cover the doughnuts is to just dip them directly into the glaze while it’s still warm.